Nexla is a distributed DataOps platform built from the ground up for real-time event stream processing. With Nexla, the whole team can collaborate on event stream processing as well as batch processes or files. Empower analysts, data scientists, and business users to access the data they need. Read on to understand Nexla’s SaaS capabilities for event stream processing and data operations. 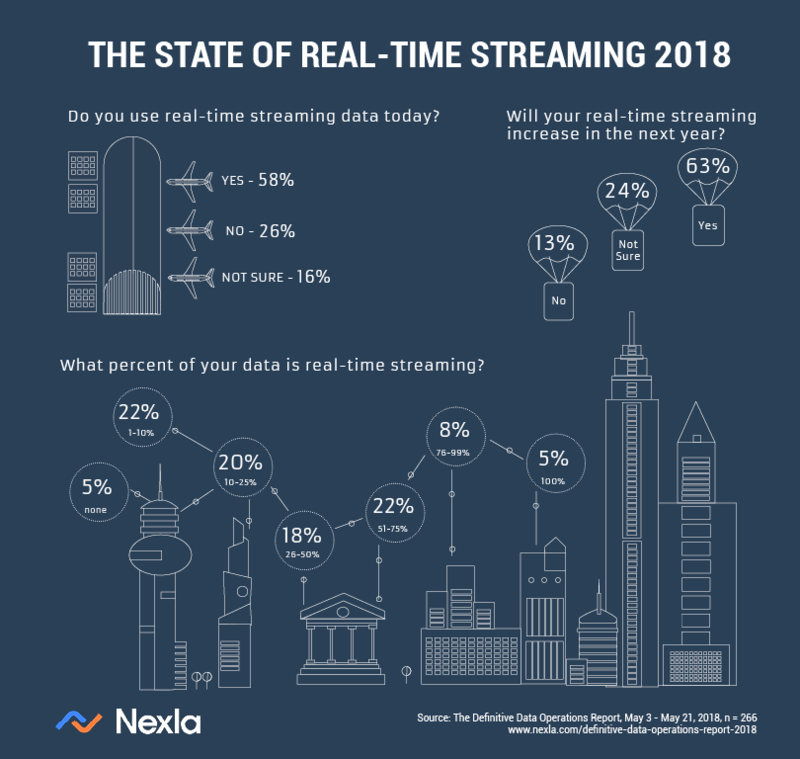 According to the 2018 Definitive Data Operations Report, 58% of companies are using real-time streaming data today. Further, 63% say their use of streaming will increase in the next year. With more streaming data, some data stakeholders can lose access to data that was available in CSVs, files, or tables. But the benefits of real-time event stream processing aren’t only for data engineers. Using the Nexla DataOps platform, any data-aware user can access the data they need to get the job done. Nexla’s distributed event stream processing runs in the background and scales automatically. Data professionals can configure real-time transformations with a clickable user interface. For most transformations, there is no need to write code or even SQL queries. For more complex processing, engineers can create custom transformations for all users. Nexla can also connect to file or batch processes and turn them into event streams—through an easy-to-use user interface. As the transition to streaming is well underway, companies still rely on important batch processes and file transfer. Nexla navigates between batch and streaming within the same platform, with the same controls. The flexibility to switch from batch to stream and vice versa is critical for inter-company data movement, for example. Nexla makes it easy to convert batch to streams, depending on what the service requires. Nexla makes it easy to control exactly which attributes you send to internal systems or share with external partners. Built-in transformations make it easy to hash or obfuscate personal and private info with a few clicks. De-identify data for analytics or data products with confidence. Never risk sharing clear text data again. All data is transformed in-stream, in real-time. Admins keep complete control over who in their organization can access and create data streams. Audit logs and alerts ensure compliance with data governance requirements. End-to-end data encryption makes Nexla event stream processing secure. Real-time schema detection and validation make sure the data delivered is accurate. In-stream monitoring is critical since it means business doesn’t have to stop if a non-breaking schema change is detected. If breaking changes happen, know instantly. Detection helps you find issues as they happen in real-time. Questionable records go into quarantine for further evaluation or correction. All event stream processing flows have intelligent automation that alerts users when unexpected or anomalous values occur. Plus, configure custom notifications specific to your needs. Data monetization is fueling top-line growth at high-performing companies, according to McKinsey. But, creating marketable data products is not easy. A flexible underlying architecture is essential for data products. Data sources and formats are always changing. This is especially true for data products marketed externally. It’s impossible to predict all the methods in which customers will want data delivered. A data architecture that can handle real-time streaming data, as well as batch delivery, is essential. Monetizing data products requires customization and enrichment based on customer demands. It’s important to be able to filter, transform, and enrich data to accelerate customer onboarding and respond to changes. Empowering users outside of engineering to make changes—while maintaining guardrails and controls—can accelerate top-line growth and customer satisfaction. A robust security protocol is critical for any data product but is difficult and time-consuming to build. Nexla’s built-in encryption, hashing, and anonymization capabilities operate out-of-the-box. Custom transformations or data processes can be added to and stored in the platform. Time to market is critical and with Nexla, security doesn’t need to add extra time. When building data products for external consumption, understanding usage is a challenge. A customer’s data usage is typically hidden. Nexla’s monitoring capabilities provide insight into how often your customers are ingesting your data. Understand completely what data is being ingested, volumes, and record counts. Because the data flows through the Nexla platform, data lineage comes included out of the box. For every value understand the path, source, timestamp, and more. Nexla makes managing the data product lifecycle easy. Quickly revoke, change, or update user and organization access. Make requested changes through an intuitive UI with access to action logs and versioning. To learn more about how Nexla can help you make streaming data accessible to all, request a demo.